Breakfast, or desayuno, in Spain might be very different from what you might be typically used to. Breakfast in most European countries verges on the smaller side. Unlike the classic breakfasts from the UK or North America, The Spanish don’t eat large plates of eggs and bacon for breakfast. But you’ll find there is still plenty to enjoy! In Spain, breakfast occurs between the hours of 8 am to 11 am. It’s important to know that some here do not even eat breakfast, as lunch in Spain is typically the largest meal of the day and most locals want to have their appetite for the midday break. In these cases, many will just have coffee or tea. 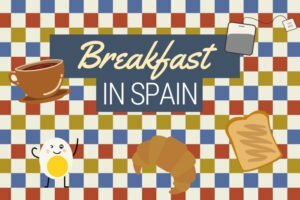 Keep reading to discover what a breakfast in Spain will consist of and a few restaurants where you can purchase a traditional Spanish breakfast! 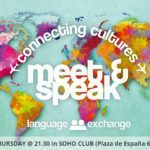 If you want more of an overview of the different types of food that Spaniards eat throughout the day, and not just breakfast meals, then click here! One of the tastiest foods that Spaniards eat for breakfast has to be chocolate con churros. These delicious sugary sticks of dough dipped in chocolate are the perfect way to start your morning. 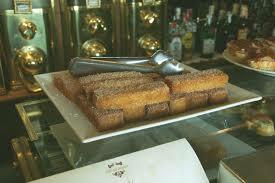 In fact, having a sugary breakfast is quite common in Spain. Locals, and not just the children, will have cookies, chocolate milk, and, especially, churros for breakfast quite frequently. 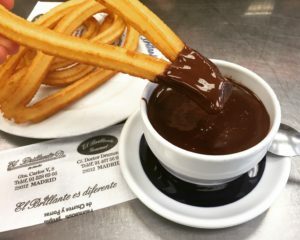 We have an entire article on where to find churros in Madrid, check it out and try some churros for breakfast the next time you have a chance. I would be remiss if I didn’t mention the churro restaurant, Chocolateria San Gines, that’s open 24/7. This breakfast food consists of small slices of toast, or croutons, that have been fried with butter. Like churros, you can eat los picatostes with chocolate, or you could have them with coffee. 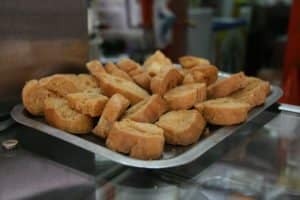 This snack or breakfast can be served either hot or cold and can be found in many different bakeries across Madrid. 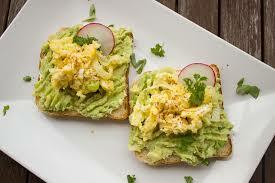 Another traditional breakfast for Spaniards is simply toast. There are many different ways to prepare your toast in the morning if to have a Spanish breakfast. You can have pan con tomate (bread with tomato), pan con jamon (ham), or pan con aceite (olive oil). Olive oil is also one of the most popular products of Spain, so if you have pan con aceite, you will be enjoying one of Spain’s most important exports. As you can see from the other breakfast meals, in Spain they prefer to have some type of carbohydrate for breakfast, croissants included. 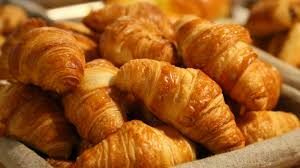 There are several different types of croissants that you can enjoy in Spain, from those filled with chocolate, to almond croissants, to a croissant with olive oil. 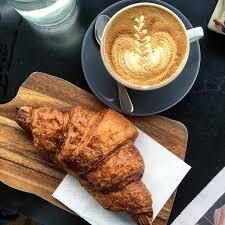 You’ll find croissants in most bakeries in Madrid. As mentioned before, in the morning many Spaniards will only have a cup of coffee. 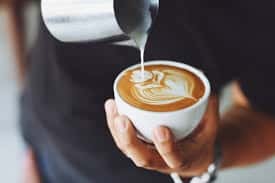 When ordering coffee, remember that “cortado,” means coffee with a little bit of milk, or “cafe con leche” means coffee with milk. If one cup of coffee isn’t a filling enough breakfast for you, then enjoy it with any of the above breakfast foods. 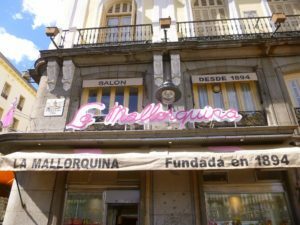 There are many different cafes in Madrid to enjoy coffee! 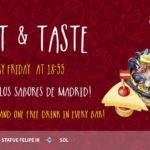 If you’re looking to eat brunch in Madrid, then check out our other blog that specifically focuses on brunch! 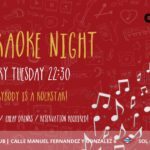 Brunch is not a meal that the Spanish usually have, however, due to the high number of internationals in Madrid, there are a few restaurants where you can eat brunch. However, if you’re looking for a more traditional Spanish breakfast, then keep reading here. 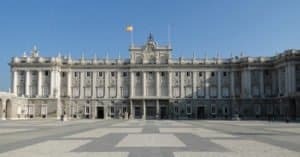 Since the meals are on the smaller side, eating breakfast in Madrid is very affordable or can be made easily at home. 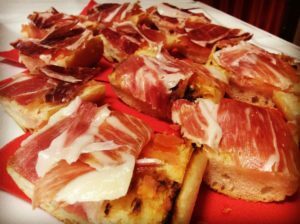 I hope this article has given you a good overview of breakfast in Spain, so you can understand what its all about here! Although the breakfasts here may be smaller than what you’re used to, they’re still delicious. Be sure to try all the different types of breakfast foods while you’re here. If you’re looking for vegetarian or vegan guides, then you’re in luck, we have those too. 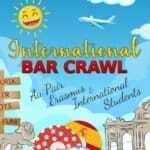 If you don’t see any restaurants to your liking, then our Tapas Tours might be a cool idea to explore. We’ll take you to several different restaurants around the city, and you can decide for yourself which is your favorite. And finally, if you want to learn how to make some of these dished yourself join our cooking classes! Check the next available date here. 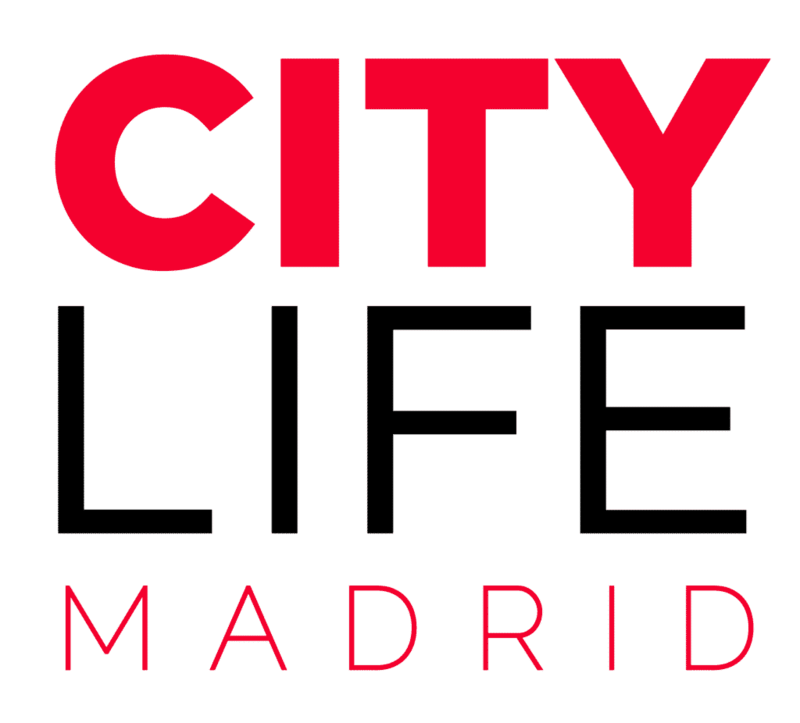 Enjoy exploring Madrid!